Making it easier for cats to come and go. 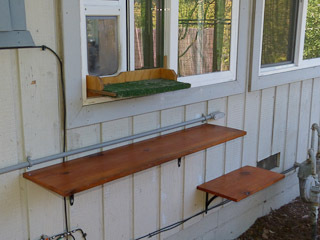 After about two years of weathering and cats jumping on them, it was time to replace our original aging cat step shelves to our external kitty door. The originals were composed of basic 1/2" plywood covered with plastic grass to provide good grip for claws and help clean messy paws. One of our cats is older and has hip problems so the shelves were spaced accordingly to make it easier for him to negotiate. The old shelves were starting to get ratty-looking, coming loose and would make loud "clunk" noises when the cats would jump onto them as the screws were beginning to come loose. We also have one cat who likes to nap on one shelf, making it difficult for the older cat to get past the napping cat. So there were a number of reasons to replace the old shelves. Cats love new things as well, so it would give them all a little adventure as they discover the new shelves. The new shelves are wider and offer more options for access. They are also made of plain wood (pine) shelving as opposed to plywood. I stained and waterproofed them, so they should last well. The black metal brackets I had used for the old shelves were still in good shape, so I repurposed those and installed them below the new shelves with galvanized roofing screws. This provided better stability and safety. Plus it looked better, too. These shelves should be a bit more durable. The small shelf up by the cat door remains unchanged. It is designed to easily slip in and out of the window frame for cleaning. I also used a length of the new shelving in a different place on the exterior wall. 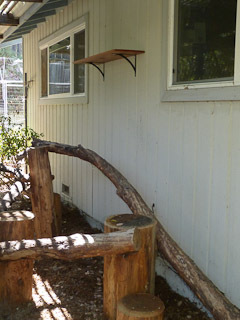 We have a cat climbing tree made from stumps and large tree branches in the cat run area so I mounted the other shelf on the wall above the climbing tree. One of our cats loves high places so he will surely enjoy the new higher vantage point. I will be installing additional lengths of shelving on the exterior wall in the cat run soon to provide even more places for them to nap and play. In the mean time, they will have more to do and better access for a while. After all the new shelves were up, I puttied the screw holes left over from the old shelves. I'll touch up the wall paint after the putty has cured. 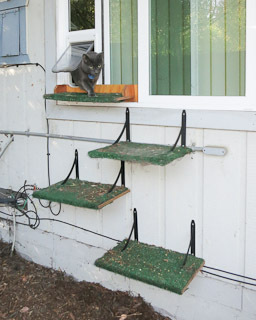 These kinds of projects are fairly simple and great for improving the life and mood of your cat.